Shoes Shoes, Glorious Shoes. You know I love 'em, you know I wear 'em and you know that I am always on the lookout for new pairs to come home and live in my home. I was perusing my Instagram one day, as I often do, and a joint event between my buds at Urban Grape and a brand I'd not come across, Ser Verde Shoes popped up in my feed. A shoe brand that's local and I hadn't heard of them? For shame on me, a lover of shoes. Well, I knew I wanted to know more about their brand and since I'd been skulking on the 'nets I decided to reach out and get the lowdown on what Ser Verde shoes are all about! I caught up with Amy Lambroukos-Silva, owner and designer with some of my Local Lovin' questions! Give us a little background as to how Ser Verde Shoes came about. What initially drove you to start your brand? I was traveling five years ago and found these beautiful Spanish style shoes. I bought a few pairs and initially fell in love with them. Years after that I searched all around the US for similar style shoes with the same quality and did not have success in finding them here. So I got in touch with the factory through where I bought the shoes and started the business with my husband, Chris. Ser Verde means be green which just really came to me. I love our customer feedback and definitely take note of that. Everyone of course has a different styles, which makes designing so much fun. I love the beach and the ocean so we designed our shoes with a boat friendly natural colored rubber sole so it does not scuff a boat's deck and the natural color is really pretty and matches every leather that we work with. I have always love shoes myself so this has been so much fun for me and I feel like it makes you work harder when you have a deep passion about what you are doing. We are still only a year into this business so we are hoping to make the bread-and-butter soon but it is a process. But we are very positive that it is going in the right direction. We are both born and bred New Englanders. We are both more summer people than winter. We love New England beaches and spending time with our three-year-old son Preston who is also very much a beach person, yay!!! We love traveling up to Kennebunkport and going to Goose Rocks Beach. We also love lobster so any summer travels around New England definitely include that. 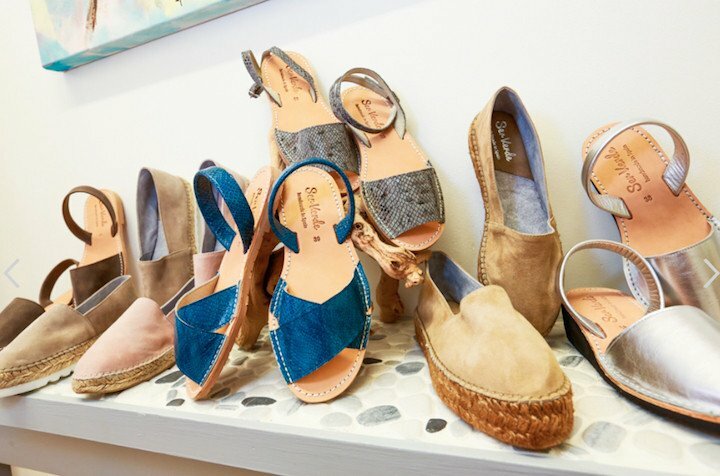 We also love Nantucket and are selling our shoes over at SkinnyDip on South Wharf this summer. So we are hoping to make some more trips over for a little business as well as pleasure. You have certainly found some fantastic early success! Where do you see Ser Verde Shoes headed in the future? We see ourselves expanding outside of New England because we are focusing this business around primarily a summer type of shoe. And hope to do more wholesale around the country as well as some trunk shows which have been great so far. We are also collaborating with Calypso St. Barth this summer starting soon. We are extremely excited about that. You can find Ser Verde online, on Facebook, Twitter and Instagram!